Home to world-class diving sites, stunning white-sand beaches and the famous Ifugao Rice Terraces, this list of the Philippines’ most popular tourist destinations can be pages long. But, with its 7,641 islands spread over 300,000 square kilometres, working out how to send a parcel to the Philippines can be a difficult task. Helping you get your parcel to the Philippines on time whether you’re looking for a parcel service to Manila, Quezon City or even to the Coral Triangle in Palawan; at DPD Local Online we can get your parcel wherever you need it to be with the minimum of fuss. Our easy-to-use website will help you research the parcel service that will suit your needs best and, as we’re trusted by millions of senders across the world, you can be certain that you’re booking a courier service that will meet your budget with no loss of service. 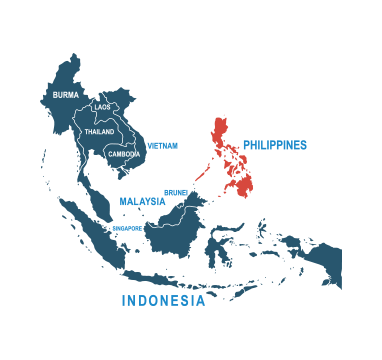 If you’re looking for cheap parcel delivery, look no further than DPD Local Online to get your parcel to the Philippines. Up to £50.00 of compensation with extra compensation available to the value of £5,000.00. This is a fully trackable service. Delivery within 6-8 working days. Do I need to deal with customs when sending from the UK to the Philippines? When posting to the Philippines, you’ll need to complete a customs declaration in order to ensure your parcel can be delivered safely and on time. With DPDLocal-Online, however, dealing with customs is easy. That’s because whenever you book for international delivery through us, we’ll send over all the correct documents you need to ensure that your parcel gets to its destination without any hassle. How much does it cost to send a parcel from the UK to the Philippines? Postage to the Philippines starts as low as £26.33 when you book through DPDLocal-Online. We’re able to negotiate such cheap parcels for you by cutting out the extra fees that some couriers normally demand while retaining the same quality of service. And with loads of choices on all our services, you can send in whichever way you want to when you book with us, too. How should I address my parcel for delivery to the Philippines? There are two ways of addressing your parcel to the Philippines. For most addresses, you’ll just need to write the province name (they work in a similar way to counties here in the UK) alongside the post code on the second-to-last line of the address, followed on the last line by the country name in block capitals; in this case, “THE PHILIPPINES”. For a clear explanation on how to address a parcel to the Philippines, you can refer to the Universal Postal Union’s useful guide. What items can I send? Replicas of weapons like hand grenades and rifles. Check with the Philippines’ Bureau of Customs for more information. You can check out our prohibited items list online for items that won’t be carried by our couriers. Getting a quote is easy. Just enter the details of your parcel (its weight, height and length) into the quick-quote tool above, click Quote & Book, and choose the courier quote that’s right for you. Simple. If you need any more information, you’ll find plenty of helpful stuff at our online Help Centre There you can browse our FAQ guides — covering everything from packaging tips to international shipping advice — or talk to one of our friendly advisors via the chat window.